It's that time of the year when the team at NDHAG look back on all of our highlights throughout the year. One of which was the trip to Lithgow in April that we didn't put on the blog. We thought that since it was such a successful field trip it would be remise of us not to report on it! So we have! On 5 April 2014, members of Nepean District Historical Archaeology Group did a short history tour of Lithgow and surrounds, starting at the Ambermere Rose Inn in Little Hartley. The building was opened as an inn in 1845, to service the travellers on the Western Road during the building of Victoria pass. It was not until 1846 that Joseph Collits named the building Rose Inn. 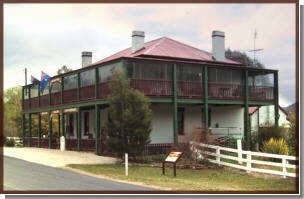 The building was in constant use as an Inn until 1874 when the railway took over as the preferred method of travel to Bathurst, Lithgow and beyond. In 1922 the land and buildings were bought by Miss Mawbey who turned it into a guest house and named it Ambermere. The NDHAG group met in the grounds of the Inn at 10am and were shown around some of the interior rooms in the historic inn by the current owner Fiona Richardson. The building was bought in 1962 and won an award for its restoration by the then owners. There are photos and mementos of the Inn’s past on the walls and shelves throughout the building which adds to its appeal. On the back road to Lithgow we stopped to look at the monument on the escarpment, built to commemorate the most westerly point Blaxland, Wentworth and Lawson reached when crossing the Blue Mountains. Then on to Lithgow, and the remains of the blast furnace and iron and steel foundry started under the direction of Enoch Hughes in 1875. It was rebuilt by William Sanderson in 1906-7 and served the Lithgow Iron & Steel Industry until 1927. There are message boards located throughout the site; on or in front of every building, or where a building once stood. These boards explain what was done in that particular area, or which building had been there. The site is not just a jumble of decaying buildings. There are several brick buildings that enable you to see what they were used for and how they were built. The remaining brickwork is very impressive. Some of the walls are over 4 bricks thick, (40 inches or 1 metre) with arches and circular openings. Brick debris is scattered throughout and a brick bearing the initials WS was also found. It is assumed that it represents its builder, William Sandford. An unusual occurrence in itself as a builder’s name is not usually displayed on the bricks. After Leaving the foundry we went to Eskbank house, which is a heritage listed property and museum in Lithgow. The house was built for Thomas Brown in 1842 and has had several owners since. In 1948 it was bought by Eric Bracey and deeded to the Lithgow community. Bracey then spent 18 years amassing a significant collection, including all the furniture displayed in the house. The house and property was opened as a museum in 1966. This includes the surrounding buildings, blacksmiths shop, hexagonal garden house and a pottery collection building. 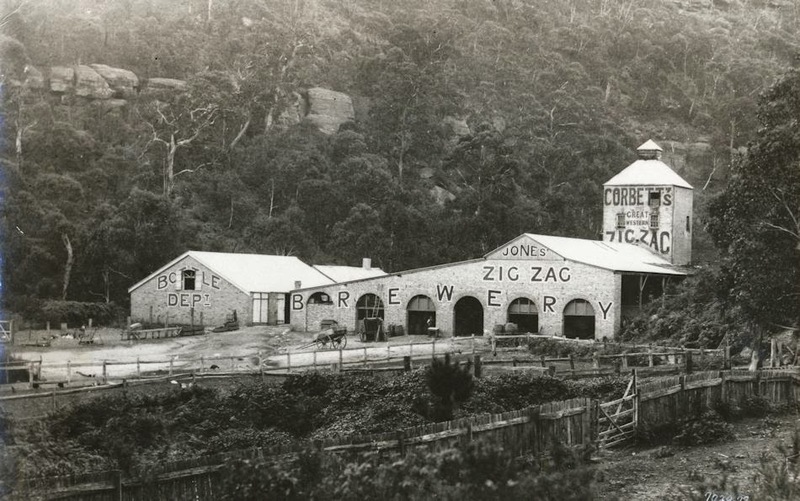 The Zig Zag Brewery was our next stop, built by Henry Corbett and first opened in approximately 1888. It was also known as Terry’s Brewery and the last brew was made there in the late 1950’s. In the 60’s and 70’s it was the home of Dale’s soft drinks, and in 1991 a spring water business was started on the site and is still going today. After leaving the brewery we drove pasts Collits first inn, also known as the Golden Fleece. This was built in 1823 for the trade on the first road down the mountain, which was at Mt York. The Inn is now a private residence. We continued onto the Comets Inn in Hartley Vale which was built in 1879. The Inn was named after “Comet” brand kerosene, which was obtained from the shale mined in the area. The hotel was one of 12 in a quarter mile area, and there were also dwellings for miners, a school, post office, butcher and a baker. In 1912 the hotel was advertised as a guest house, which it is still today. After a long and exiting day we all headed back over the mountains and agreed that we will have to do this again.